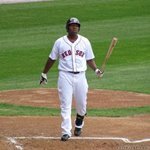 Raymond Payne \"Chip\" Ambres (born December 19, 1979 in Beaumont, Texas) is a right-handed Major League Baseball outfielder for the Boston Red Sox organization. As a senior at West Brook Senior High School in Beaumont, Texas, Ambres was named a second team All-American by Baseball America, a USA Today All-USA high school baseball team member, and was a highly recruited quarterback. Ambres signed a National Letter of Intent to play football at Texas AM University, but opted for baseball after he was selected 27th overall by the Florida Marlins in the 1998 Major League Baseball Draft and offered a $1.5 million signing bonus. Ambres' first season as a pro had a memorable moment at the end of the year. After being called up to the Single-A Utica Blue Sox in mid-season, the 19-year-old finished the 1999 regular season with the club, driving in 15 runs in only 28 games. In 2000, Ambres was named the No. 6 prospect in the Marlins organization by Baseball America. Ambres did not break into the Major Leagues until he was with his third organization, the Kansas City Royals. Kansas City acquired Ambres, along with minor league pitcher Juan Cedeño, from theBoston Red Sox on July 19, 2005, for infielder Tony Graffanino. The following day, Ambres made his Major League debut at Jacobs Field in Cleveland against the Indians, going 2-for-4 with a double. Ambres' 2005 rookie campaign was his best and most active season to-date. He finished 2005 with a batting average of .241 with four home runs and nine RBI in 53 games. Ambres toiled in the minor leagues in the Royals' organization in 2006 and did not appear in any games with the parent club. He became a free agent in October, after which the New York Mets came calling, signing him to a contract on December 19. Ambres was called up on July 17, 2007, to play for the Mets and had the game winning hit on July 22 - his first Major League hit since he played for the Royals in 2005. On July 24, 2007, Ambres was designated for assignment to make a roster spot for Damion Easley who returned from the bereavement list. He was assigned to Triple-A New Orleans and finished the season there. Following the 2007 season, he became a minor league free agent. On November 20, 2007, he signed a minor league contract with San Diego and was invited to 2008 spring training. Ambres was called up on July 8, 2008, by the San Diego Padres for their game against the Florida Marlins. On July 26, Ambres was designated for assignment and was outrighted to the minors on August 1 after clearing waivers. The Padres brought him back on September 2. Ambres elected to become a free agent after the end of the season after being outrighted to the minors once again. Ambres signed a minor league deal with theBoston Red Sox on January 27, 2009.